Does Ear Candle Earwax Removal Actually Work? Natalie R. asks: Does ear candling really remove ear wax or is this just a myth? Described by medical professionals as bogus, “a solution in search of a problem,” and “a triumph of ignorance over science,” the method of removing earwax that employs heated beeswax, known as ear candling, is a staple treatment for many when their ears get clogged up. But does ear candling actually work? Whatever its true origins, for those unfamiliar, the process of ear candling is relatively straightforward. First a sheet of cotton is coated with beeswax (and sometimes a bit of honey and/or other herbs as well). Sturdy enough to roll into a narrow cone shape, the narrow end of the cotton cone is set in the patient’s ear, and then the other end is set on fire. As it burns, adherents often claim that the flame creates a heated vacuum that pulls earwax from the ear into the tube. Others go further and note that the negative pressure produced by the flame via the cone also draws out “toxins” from the bloodstream. After about 15 minutes, the flame is doused and the cone removed. To view the result, a stick is shoved through the cone, which pushes out ash and a fair amount of melted wax that is darker than the original beeswax, and generally claimed to be a mixture of ear wax, beeswax, and ash from the cotton. So what does the hard data from research say about ear candling? Studies to date have definitively shown that, apart from the more obvious outlandish claims of this method purifying blood being categorically false, ear candles don’t remove any earwax from the ear save perhaps surface wax that may get stuck to the tube. As these researchers noted, more than just ineffective, ear candling can be dangerous due to the flame burning so closely to the patient and the heat of the dripping wax. 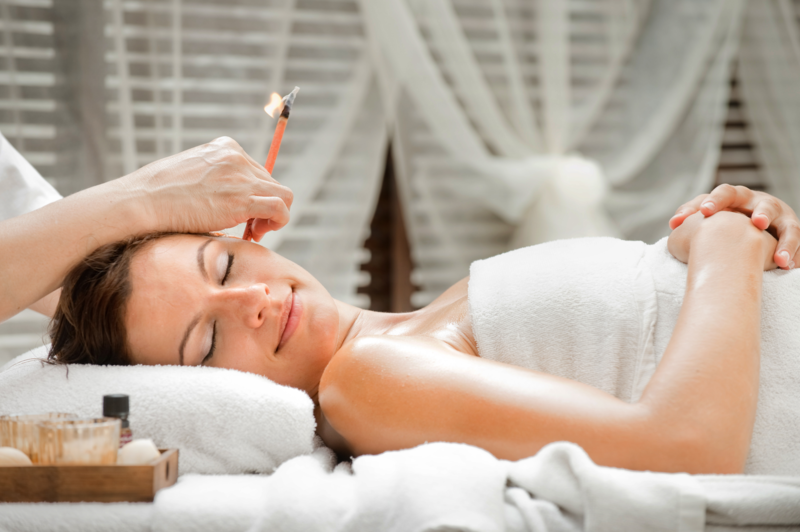 As a result, facial burns and other injuries, particularly from burning wax inside the ear canal, are occasionally noted, though as far as we could find no widespread study has definitively reported what the injury rates are for ear candling. But as an example of the type of injury sometimes incurred, in the aforementioned 2007 study, it was noted that in one case the practitioner accidentally allowed a significant amount of hot wax to enter the ear canal of the individual she was performing the method on. Seeking medical attention, the patient ultimately had to be put under general anesthesia to remove the wax that had flowed deeply into her ear. Beyond burns, a perforation of the woman’s ear drum was discovered once the wax was removed. Subsequent tests revealed that she had hearing loss in that ear; at her one-month follow-up, her hearing had not improved. So how should a person with an ear clogged with earwax remove it safely? First – don’t use Q-Tips! Physicians (and even the makers of said product) have advised- and been completely ignored- for decades that Q-Tips, like other long, thin objects, can easily puncture an eardrum. Beyond this, regular use of Q-Tips, while doing a decent job of cleaning the surface of the ear canal, has a tendency to result in a buildup of wax deep in the ear from the Q-Tips pushing some of the wax further in. Instead, for cleaning the outer surface of the ear canal, soft tissue paper rapped around the finger can suffice. As for cleaning out a build up of earwax deep in the ear canal, assuming one doesn’t have a perforated ear drum and your shower pressure isn’t too strong, lightly rinsing your ear with near body temperature water (too cold or hot can cause dizziness) for as long as necessary is a relatively effective method of ear wax removal. Alternatively an even better water method is the somewhat overpriced, though still a lot cheaper than a doctor’s office visit, Elephant Ear water bottle sprayer that many doctor’s offices use for cleaning ears. The general method here is to fill the spray bottle with warm water, tilt your head slightly, partially insert the tip into the ear canal, and begin vigorously spraying at various angles until the built-up ear wax is flushed out. For extreme blockages, it may take several minutes of spraying to completely remove the ear wax, but this will eventually get the job done. To speed the process up, over-the-counter ear wax softeners may help soften the wax up before spraying, though these aren’t strictly necessary. Just plain warm water will do the trick eventually. All this said, for most people the majority of the time manually removing ear wax from the ear canal is not necessary and can even be harmful if done too often as earwax serves a few useful purposes, such as working as a lubricant and helping to stop your ears from becoming too dry and itchy. Its stickiness also helps trap dirt and other such foreign invaders to your ears. In the end, most of the time for most people ear wax is naturally pushed out on its own, with mere surface level cleaning in a bath or shower being sufficient to tidy up the ear. Of course, ultra-dry climates, ears that produces excessive wax or are oddly shaped internally or other such abnormalities may make it so the occasional buildup occurs, resulting in diminished hearing or even full blockage of the canal. For those times, rather than reaching for the Q-Tips, which long term will exacerbate the problem, or attempting the useless ear candling method, (assuming you don’t have a perforated ear drum) try something that actually works like the Elephant Ear sprayer, your shower head (with pressure turned down to a comfortable level), or simply head to the doctor’s office and they can clean your ear out in short order. Can Honey Really Be Used for a Variety of Medicinal Purposes? Is Eating Your Boogers Good For You? Should general practitioners recommend it? What is the principle that makes an ear candle work?